The award-winning Whyalla uneARTh Festival is back in 2018! thanks to everyone who suggested a name for our 2018 wHYALLA UNEARTH FESTIVAL mascot. We have a name for our 2018 Whyalla uneARTh Festival mascot thanks to Rebecca Gow – welcome to the uneARTh world ARTie. 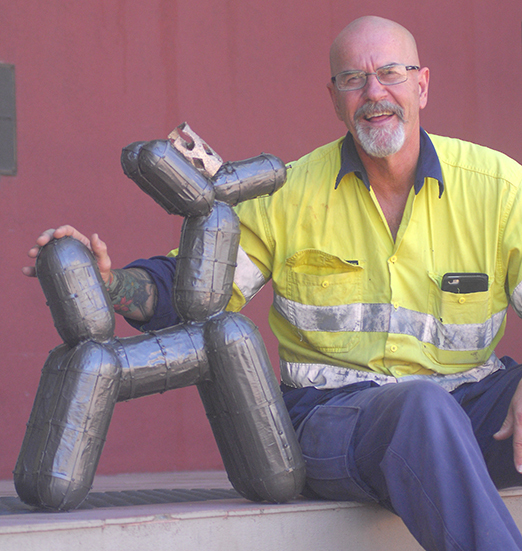 We asked Whyalla to come up with a name for the uneARTh Festival mascot beautifully made by our own Pete Santucci. We had a stack of suggestions and it was a tough task for the judges. There were some great suggestions with Rusty being a big contender. Frank (furt) was a good one, as were Steely, Dig the Dog, Spark Pug, Chew Barka and Waylla the Dog. We even had plenty of people thinking it should be Pete after its creator - Pete was very flattered. The award for the cutest could go to Rachel Barlow’s four-year-old who suggested Princess Nunkey. If we happen to get a female version of the dog … that will be her name! But it was Rebecca’s suggestion that resonated with the judges. It built in the “ART” of the uneARTh Festival and is a short, sharp and sweet name that really encapsulates what the festival is all about … arty and exciting. Rebecca wins for herself a double cinema pass to the Middleback Arts Centre. So look out around town as ARTie starts to pop up here and there in the lead up to the 2018 Whyalla uneARTh Festival on March 30-31. Whyalla offers a range of comfortable modern accommodation where you might stay a little longer than you planned. Whyalla features hotels, motels and four star apartments or cabins and caravan parks if sharing road-trip stories is more your style. The line-up for this year's Whyalla uneARTh Festival is chunk-filled with Fringe acts, headlining acts and top local talent.